Macular degeneration is an eye condition that refers to the deterioration of the macula, which is the central part of the retina. The macula is involved with providing clear vision and focus, which allow you to read, drive, distinguish colors, and recognize faces. However, it typically doesn’t disrupt peripheral vision. More so, people can actually live with the condition and continue to perform usual activities or follow a daily routine. Macular degeneration is commonly referred to as age-related macular degeneration (AMD) because it usually develops as a person ages. In fact, it is the leading cause of irreversible vision loss among Americans aged 60 and above. Macular degeneration is expected to affect more people in the years to come. It is estimated that by 2050, the number of individuals who will have macular degeneration will increase to 22 million in the United States. Worldwide, the number of affected individuals is expected to balloon to 196 million by 2020 and 288 million by 2040. During its early stages, macular degeneration may not manifest any symptoms. In some cases, signs are just not evident. Typically, symptoms only become evident when both eyes are affected and when a spot or blurry area in the middle of your vision appears. When you experience any of the symptoms mentioned above or anything unusual with your vision, see an eye doctor right away. 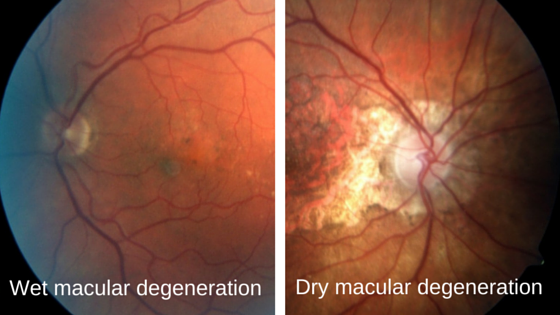 Macular degeneration is classified into two different types—dry and wet. Dry macular degeneration is signaled by the presence of drusens or yellow deposits in the macula, which are detected through eye exams. Few of these deposits will not cause any vision loss, but they can affect how a person sees when they increase in number. Dry macular macular degeneration is the most common form of the condition and accounts for about 90% of cases. Wet macular degeneration happens when abnormal blood vessels grow in the macula and leak blood and fluid in the retina. It can disrupt vision and distort the appearance of straight lines. It is also signaled by blind spots and loss of central vision. Wet macular degeneration is more advanced and less common, accounting for only 10% of cases. However, it can cause more damage as 90% of legal blindness is attributed to it. Age – Macular degeneration develops with aging, which goes to show that older people are at a higher risk. Family history – Macular degeneration can be hereditary. If there’s a history of macular degeneration in your family, you may be at a higher risk. 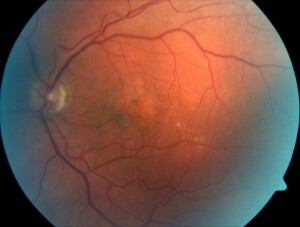 Medical conditions – High blood pressure and cholesterol may add up to the chances of developing macular degeneration. Skin color – Light-skinned individuals can be more prone to the condition. Gender – Females are more likely to develop macular degeneration. The best way to prevent the disease is to consider your risk factors and take steps to minimize those that you can control such as health habits. Maintain an ideal weight, avoid habits such as smoking, and wear sunglasses or hats when heading out on a sunny day. Regular eye check-ups can also be beneficial in thwarting macular degeneration. If you’re older than 45, it’s advisable to have regular complete eye exams for every two to four years. Treatment options for macular degeneration ranges from oral medication, such as anti-angiongenesis drugs and vitamins, to more intensive procedures such as vision aids, laser therapy, submacular surgery, and retinal translocation. Think you have macular degeneration? Have your eyes checked at Arizona Retinal Specialists. We treat different eye conditions with effective treatments and procedures. Our team is spearheaded by Dr. Gholam Peyman who is responsible for the invention of LASIK surgery. Please get in touch with us today to set an appointment or get in touch with us to learn more about our services.